The main shopping street in Reykjavík is also called Laugavegur. Both can be very busy. It’s the most famous trail in Iceland by far. best route is Landmannalaugar – Skógar 77km (48mi) in 3-6 days in either direction. That’s combining the Laugavegur 55km (34mi) with the Fimmvörðuháls route. high water can stop hikers (and vehicles). Bring shoes for river crossing. steep rough, rocky and slippery slopes. Snow, sleet, mud likely. Jagged lava fields. in perfect weather, this trek is only moderately difficult. The weather is never perfect. Click PLAY or watch some drone footage on YouTube. be prepared for long snow fields. A few days each year they turn to slush. hypothermia can kill. Bring proper clothing and waterproofs. May 1970 three hikers died in a snowstorm on the Fimmvörðuháls section. End of June 2004, hiker Ido Keinan died just one km from the Hrafntinnusker hut. there may be swarms of flying insects, though most don’t bite. Normally it’s so windy that the bugs are not a pest. Compass recommended. Maps can be bought in book shops and petrol stations. GPS is also recommended in case of zero visibility on the trail. Coordinates can be found at the huts. Meals are not available in most huts. But small shops MIGHT be open in high season. Landmannalaugar and Þórsmörk are the most developed campsites. no pillows, blankets or bed linen available. You need your own sleeping bag. Laugavegurinn is maintained and serviced by Ferðafélag Íslands (FÍ), the Iceland Touring Association (www.fi.is). Limited accommodation is offered in huts (reservations necessary) or in campsites (reservations not needed) near the huts. Wild camping is not allowed within the nature reserves. If there is space in a hut, tenters could grab a spot last minute, payable by credit card or cash. Bus Reykjavik to Landmannalaugar is about $90 (2018). There are three bus operators: Reykjavik Excursions, Trex, and Sterna Travel. Bus Reykjavik to Reykjavik Skógar is about $50 (2018). It a much better and busier road. Some try to hitchhike that section. Most hikers are coming to and from Reykjavik. Most do a lollypop loop to and from the trailheads. The best hike is Skógar to Landmannalaugar either south to north, or north to south. 77km (48mi) in 4-6 days. If you have less time, do just Thórsmörk to Landmannalaugar in either direction. 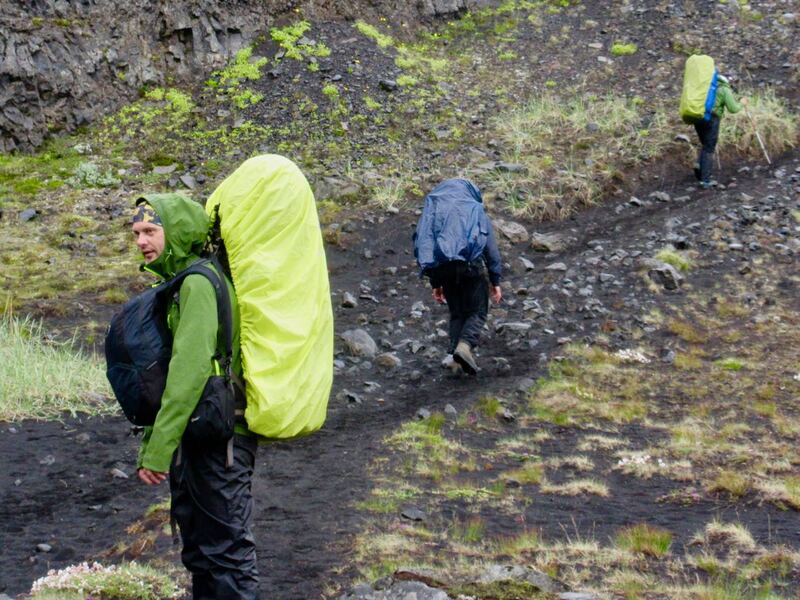 That’s the classic Laugavegur trek 55km (34mi) in 2–4 days.. If you have even less time, do just Skógar to Thórsmörk in either direction. That’s the Fimmvörðuháls route. 22km (13.6mi) in 1-2 days, over 1000m elevation change. Though some feel it’s the most challenging section, many do it as a day hike during good weather. The bus schedule is posted on the toilet in Skógar if you’ve not written it down in advance. We like the longest option, taking the bus Reykjavik to Landmannalaugar to start. From Thórsmörk you can bus out. Or do the extra 1-2 days to Skógar. Day 5 : Thórsmörk – Fimmvorduhals hut … or on out to Skógar where tenting is available near the highway. We prefer to tent. That way no reservations are needed. We’ll stop where we want when we want, depending on the weather and our energy level. Allow extra days, just in case. We were held up one day by storm warnings in 2018. Take the bus back to Reykjavik from Skógar. There’s plenty of traffic on the highway. You may be able to find someone willing to drive stinky hikers back to town. If not, buy a ticket on the bus. If all that sounds too complicated, consider signing on with a trekking guide. Many carry very heavy packs on this adventure. But you can hike with a light day pack if you hire the right guide. They’ll transport your pack day-by-day, hut to hut. If you’ve signed on with a guide, let them take care of the logistics. This section is for independent hikers. Flying to and from Iceland in the hiking season has been expensive. But WOW Air started a new discount service, putting pressure on the others. We recommend tenting and hostels. One cool option is a package with rent-a-car and hostels both included. Decide where to stay as you drive around the island. There is a LOT to do and see in this tourist paradise. If you are only doing the Laugavegur, however, you won’t need a rental vehicle. Laugavegurinn – the Laugavegur hiking trail, a booklet by Ferðafélag Íslands, is available in Iceland. And is for sale at each hut. That should be enough for most hikers to survive. In 2018 we used the excellent Brian Zimmer book. We downloaded it to phone and read it from the Kindle app. Be sure you get the most up-to-date edition. Click PLAY or watch Alastair Humphrey’s highlights on Vimeo. I’m planning on walking the Laugavegur, and then to Skogar, the second week of September. What side hikes would you recommend if I were to stay one or two additional days at one or two of the huts? I was planning on staying one extra day at Landmannalaugar, but the hut is full and I can only stay one day. You mention the ice caves. Where are they located? Thanks in advance. Sorry David. We haven’t done the trek as yet. You’ll have to keep searching the internet to answer those questions. Hey David, I’m doing the trek on the second week of September as well! When are you starting the trail? I start on the 9th but plan on camping in Landmannalaugar the night before hoping to do some short hikes. I believe that each hut there should have info about day treks in the area, at least that’s what I read on my guide book. Hi, Great write up. I’m just wondering what weight you got your kit down to if you tented along the route? It seems including food, kit could be quite weighty. Hi there, this info is very helpful! We are planning to hike the Laugavegur from Landmannalaugar to Thorsmork from 6/22/16 – 6/26/16. We’ve reached out to reserve the appropriate huts but it came to our attention that it is unclear as to when the huts will open each year. How far in advance will it be determined if the huts will be available? And, how do you pay in person once you reach the hut or in advance? We’d like to know when we’ll need a plan B in terms of an alternate trek to do while in Iceland during this time of year. My one attempt to do the hike in June was unsuccessful. Still too snowy and muddy. But I spoke with the #2 and #3 hikers to get through. They said it was a disaster. One more Question, Is wildcamping forbidden along all the trail, or just some parts of the trail? we like to have our own camp with some mates. Whether allowed or not, I usually wild camp. Discretely. Out of sight. Should be no problem in that terrain. Hi, we are planning the trail in june aswell, we want to start the 25th. Why is june risky? just because its though? or is it really dangerous? There may be too much snow and mud. I was there in June and decided not to go after listening to two of the first three that made it. Is there a camping supply store on the start of the Landmannalaugar trail head? Id like to purchase propane? Also how did you fill up your water bottle? will this trek be open? October is risky, I think. But I’m not sure whether or not it is officially open. – if you don’t have a reservation for a hut, are there any kitchen facilities? – what kind of food do you bring along the way? Is there fresh water available widely? – what’s the temperature like at night? Thanks Cecilia. Looks like Jimmy’s taken that down. Our plan is to hike from Landmannalaugar to Hvanngil on day one and from Hvanngil to Thorsmork Volcano Huts on the second day. We know this is about 16 miles (27k) per day. Is this crazy, or will it work out okay? Our planned dates are the last week in June. Also, we were going to drive from Reyjkavik and pick up the bus to Landmannalaugar somewhere along the way. Where is the best place to meet the bus along the way between Reyjkavik and Landmannalaugar? We thought perhaps Hella, but the bus route looks like perhaps it would make more sense to leave from Selfoss if the bus heads north from there to get to Landmannalaugar. Thanks! Psyched to be doing the route in August, been planning for a couple of years. How critical are walking poles? Should I consider this optional, or are they a must to bring along? Any other tips on things to bring (or not) highly encouraged. I do have hut reservations. Cheers! Walking poles are useful, but they are not critical. I saw some hikers without trekking poles. Great, thanks Cecilia. I went ahead an bought some for the trek. We will be doing this route in August in a tent. Should we bring a safe food container or are we allowed to leave our food in the hut during the night? Thank you! I went myself in June … but was unable to do the trail. Too wet and snowy. Going august 10 to the 20th…gonna pick 5 days when the weather looks decent and just go for it. Any recommendations what kind of pants to get? I have rain pants, is that enough to protect against the environment? Yes, I took rain pants and was more than enough. 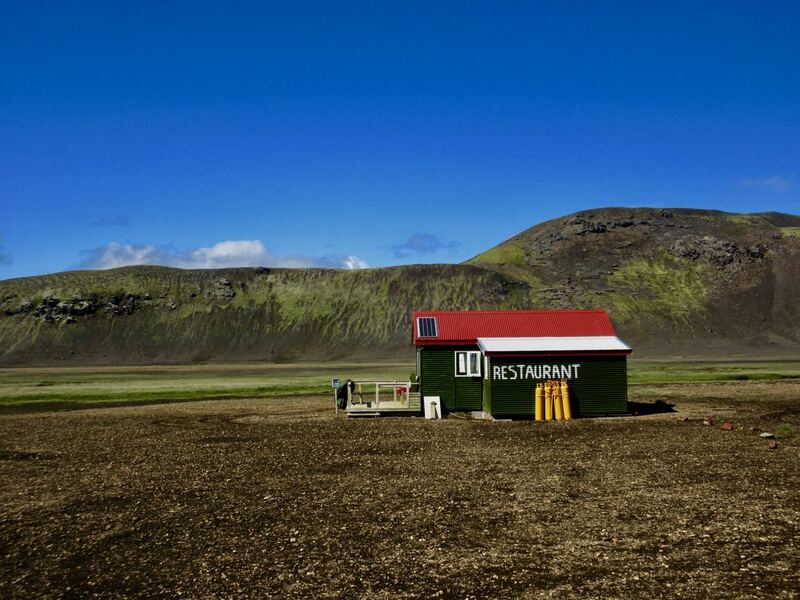 Hi guys, just wanted to let everyone know that the Volcano Huts have opened up a restaurant at the Alftavatn Hut in the middle of the trail. There you can get breakfast, lunch, dinner, snacks and drinks along with basic provisions for the trek ahead. Assuming catholes are a go on the trail or are human waste bags required for packing out? Do you suggest bringing water filtration system for between huts if need be? Hey, did the hike last week…i brought a water filter and purifying tablets with me just in case i needed it…on the trip from porsmark to skogar we used the filter cause the water was a bit ashy from the mountains. Pretty sure the water is safe to drink if its moving and clear but it was my first time there, so i didnt wanna take any chances. Hey Christos, wonderful. How was the weather? Sadly I was unable to make the trek, but am looking towards next summer now. When they say be ready for rain, be ready for it haha. But we got blessed with really really good weather overall. Only weather issues was on the way to Emtrur was the only time we hit bad weather for a few hours. Fantastic. How was the section from Porsmork to Skogar? More challenging than the rest? Did you do that all in a single day, or break it into two? Hi Christos- How was the section from Porsmork to Skogar? More challenging than the rest? Did you do that all in a single day, or break it into two? We did in one day and completed it in about 10 hours. It was the hardest out of all the hikes, because its so long and is very steep in some spots. Thanks for the feedback. Is it on a whole other skill level than the other parts of the hike, or what would you advise in deciding to continue on with that segment of the trek? Its almost a year later that im responding to this because i never saw the notification come in…i think it was definitely harder than all the other sections. If my memory serves me correctly, i think it was one of the hardest sections because the incline was really steep. Also some sections are really boring and feeling like you have been hike for days with no end in sight, but its worth it. It definitely possible, just will take a long time and very grueling. You will want to give up, but the views and feeling of accomplishment are second to none. Thanks for your response to my 2017 question! Sadly, I had to cancel my Laugavegur trek last year, so to this point I don’t have my own experience to comment on. I’m hoping that I’ll get another shot at this trip in a couple of years. I can tell you what I concluded in planning for the expedition. I was able to cancel the reservation, but I advance booked a hut spot halfway between Porsmork and Skogar, on the ridge before the descent to Skogar. Simply no room to camp on the ridge I learned, so a a hut reservation was going to be the only way to overnight this. I decided that as someone in good shape, but with little recent backpacking experience, that I would break that section of the trek into two days. Based on your feedback, it does sound pretty challenging. Was bummed to miss the chance to do Laugavegur this time last year, but wanted to post this so others can chime in and have a point of reference for their own expedition plans. 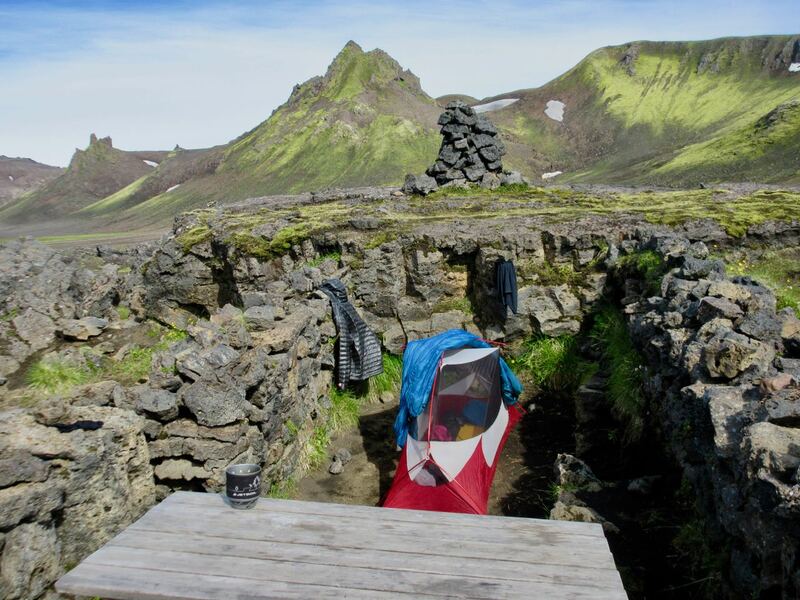 Christos, I don’t know if you passed by either of the two huts (reservations available on two different websites for each hut respectively), but perhaps based on your experience you can comment on the logic of an overnight stay to break Porsmork to Skogar into two days of trekking. Very informative and adding to list! Thanks for sharing! Hi there Griet, it is a stretch but totally doable especially since the Volcano Huts opened up the restaurant at the Alftavatn hut. You should try to carry as little as possible but take caution and prepare for any kind of weather. 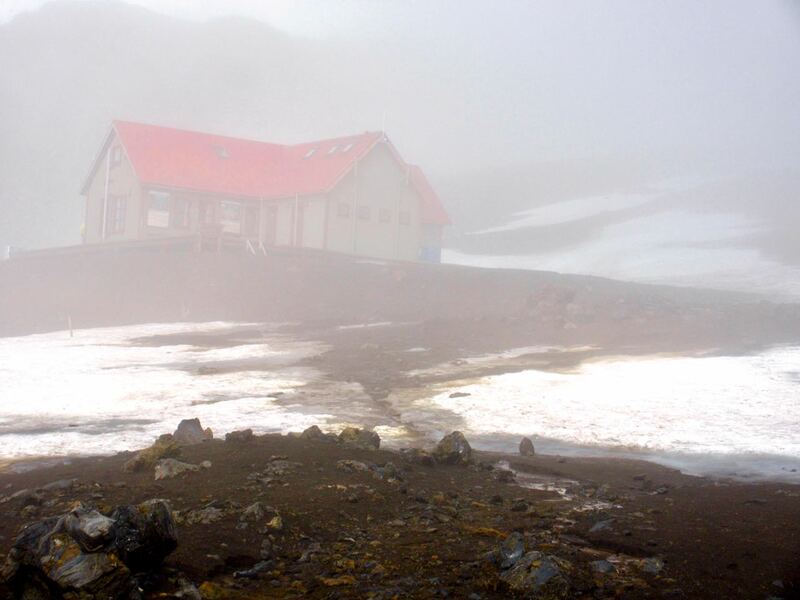 Check out the Volcano Huts online guide about the Laugavegur trail here https://blog.volcanohuts.com/laugavegur-hiking-trail-the-ultimate-guide and feel free to contact us for any further advice. thanks for your reply! finally -thanks to your suggestion- we will stay overnight at Landmannalaugar/ Alfavatn and Porsmork only. Hope it will work out, we’ll prepare to a though hike, but hope for the best…. anyway in this way we’ll avoid to take tents etc. and it leaves us some more time to see some more of Iceland the following days. IF you have any suggestions, feel welcome!